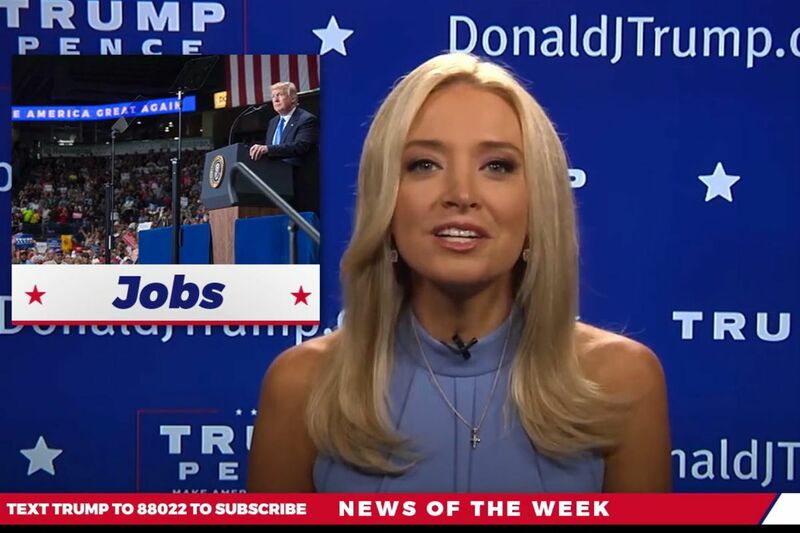 Former CNN commentator Kayleigh McEnany in a video posted on President Trump’s official Facebook page Sunday morning. At CNN, Kayleigh McEnany was an outspoken supporter of President Trump's. Now it appears she's working for him. After the conservative pundit updated her Twitter bio to note that she is a "former CNN commentator" and announced she "will be moving to a new role," McEnany suddenly reappeared Sunday morning on President Trump's official Facebook page to anchor a minute and a half of pro-Trump news. During the segment, which had already garnered more than 100,000 views by 11 a.m., McEnany touted economic numbers favorable to the president, praised the proposed Raise Act, and highlighted a Medal of Honor ceremony at the White House earlier in the week. "Thank you for joining us, everybody. I'm Kayleigh McEnany, and that's the real news," McEnany said to end the segment. Neither McEnany nor the White House immediately responded to a request for comment. "You get the same vibe from this broadcast as those paid-programming news-style programs that air at 3am," CNN reporter Andrew Kaczynski wrote on Twitter following the broadcast. On CNN's Reliable Sources, host Brian Stelter noted that his former CNN colleague "seems to have joined the Trump reelection campaign." He asked his guest, former CNN political analyst Jeff Greenfield, what he thought of McEnany's video. "Not much," Greenfield said, noting that "political campaign propaganda" isn't anything new. "Campaigns have been trying to do news-like videos ever since there was video. In the scheme of things that doesn't strike me as a particularly bothersome problem." The program, which had previously been hosted by Trump's daughter-in-law Lara Trump and is paid for with funds from Trump's 2020 reelection campaign, appears to align with rumors that first appeared during the 2016 campaign of the development of a "Trump TV" program. Prior to being fired, former White House communications director Anthony Scaramucci suggested producing video content that would have acted like "the President Donald J. Trump show." As Vox noted, during the third presidential debate, Trump's Facebook paged hosted a full show produced by the Right Side Broadcasting Network. The video, which featured staffers such as Kellyanne Conway and various conservative media personalities including Tomi Lahren and Sinclair Broadcast Group's Boris Epshteyn, has garnered more than nine million views. During her tenure at CNN, McEnany was an ardent backer of Trump's during the campaign and after his election. Back in July, McEnany defended Trump after he tweeted out a gif showing him punching and body-slamming an opponent meant to represent CNN. "It was just a joke," McEnany said. "I think it was intended as a tongue-in-cheek, satirical video. Nothing serious." McEnany was forced to apologize after wrongly claiming that President Barack Obama played golf after Wall Street Journal reporter Daniel Pearl was murdered by terrorists. Obama was still just a state senator in Illinois when Pearl was captured and killed in 2002. In a profile in the New York Times, CNN CEO Jeffrey Zucker described his group of pro-Trump panelists as "characters in a drama," with the intention of hitting a viral nerve or making a memorable appearance that can be debated over and over again throughout the day. "Everybody says, 'Oh, I can't believe you have Jeffrey Lord or Kayleigh McEnany' — but you know what?" Zucker proudly asked Times reporter Jonathan Mahler. "They know who Jeffrey Lord and Kayleigh McEnany are." "It did feel like we were on Survivor: CNN Edition," Hughes said. "While we knew we were going to villains, while we knew we were going to be demonized, [the Democrats] could never get their narrative completely going without having to deal with us."